China is buttressing the Made in China 2025 strategy with new national-level demonstration areas to spur the development of smart, green and service-oriented manufacturing. One focus is to foster the development of emerging industries and upgrade traditional sectors by furthering the integration of the manufacturing sector and the internet. Market-oriented reform and supporting policies will be rolled out to ensure that businesses of all origins can receive the same national treatment. “We need to select some cities or city clusters in China’s eastern, western and central regions for the demonstration areas. The key is to support their pilots in system and policy innovation, and to develop an innovative atmosphere and industrial clusters for smart manufacturing,” Premier Li said. “We must enable the manufacturing sector to become smarter, greener and more service-oriented, boost the transition from traditional to new growth engines and the economy climbing upwards on the value chain,” he said. Made in China 2025 was first unveiled by the Premier in his Government Work Report in 2015. Two years on, the country has seen increasingly stronger industrial capabilities, smart manufacturing, innovation, product quality and branding. Average productivity was up by 38 percent for China’s first 109 pilot projects in smart manufacturing, while operating costs dropped by 21 percent, according to the Ministry of Industry and Information Technology. The meeting on July 19 decided that the government will take advantage of a variety of government and industry funds to spur innovation and entrepreneurship, and guide more social capital to support advanced manufacturing. In the demonstration areas, the government will offer stock incentives in State-owned enterprises. The government will also further cut red tape and streamline the approval procedure, improve the business environment, and make bigger efforts in attracting foreign investment. The use and protection of intellectual property rights will be strengthened and government compliance oversight will be reinforced. “Local authorities are highly motivated after the unveiling of the Made in China 2025 strategy. Many countries also are upgrading their manufacturing sectors right now,” Premier Li said. “The Chinese economy has shown a buoyant momentum, but the weakness lies in the manufacturing sector, which requires quickened expansion. We need to focus our efforts on strengthening the sector, which is the foundation of the real economy,” he said. Premier Li highlighted the importance of opening-up and international cooperation and absorbing experience worldwide. The meeting also decided to step up the development of innovation centers for manufacturing and technology and to establish a number of public service platforms for entrepreneurship and innovation. The demonstration areas also will receive support in talent development, and encourage researchers and Chinese talent overseas to set up businesses in the demonstration areas. Land supply in the demonstration areas will receive extra support, with pilot measures to transform old business and storage facilities, idle buildings and excessive commercial real estate into incubating centers for entrepreneurship. “The innovation in system and mechanism should be on par with technological innovation. 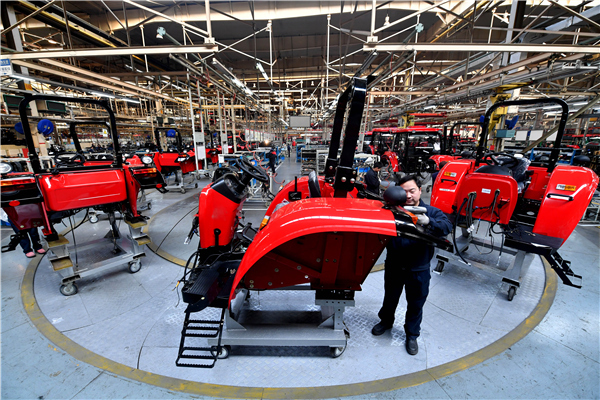 The main constraining factors for the manufacturing sector are still in the system and the mechanism, as the access threshold for manufacturing, is still too high,” Premier Li said. “The organizational structure of enterprises has changed profoundly. With the help of entrepreneurship and innovation platforms, enterprises of different sizes are developing in an integrated manner. We need to draw on experience learned and see the reform through,” he said. The Premier said funding support to the demonstration areas should be in line with market principles. The government should explore new paths of development, encourage competition and play an enabling role in building the platform and drawing talent, he added.